A little sitting area to the left of the door. Wicker or wood setee, a chair a low table for your tea. 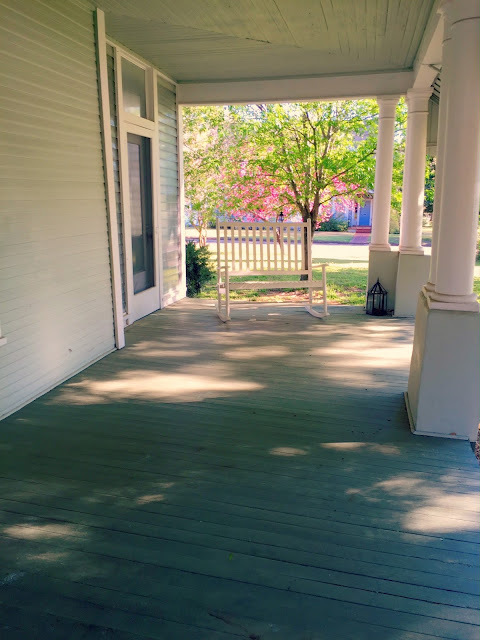 You have such a pretty porch! A porch swing...with a big cushion and lots of throw pillows....and a book. Definitely wicker, or some lovely rocking chairs. Tables for entertaining and geraniums. Lots of geraniums. And of course a bird feeder. I love to feed "my" birds. I have some cardinals who come back every year and I love to have them around the house. I am positive that I drive my husband crazy buying tons of birdseed every year, but he keeps quiet knowing how much I enjoy them. Oh, a porch swing would be so lovely! Thank you! I'm catchig up on my blog reading and your entry today was pefect as I found myself nearly in tears over the evil and persecution going on in not just the world, but our own country. I try to remind myself constantly that "He's in control of who's in control" (Larry Osborne in Thriving in Babylon). I love white wicker, so I think that would look perfect on your porch. I'm sure whatever you do will be lovely, complete with flowers from your gardens.